Sometimes we want to change any parameter of our current user interface quickly, let’s say terminal length or idle timeout, but we don’t know which user interface we are currently using. To check that we use display user-interface command. Then we try to find the “+” mark in the command output, which means that this is our current user interface. After that we have to go back to our user interface configuration and change its parameters. Why not to do that in a quicker manner? +    : Current UI is active. F    : Current UI is active and work in async mode. Idx  : Absolute index of UIs. Int  : The physical location of UIs. In case we want to change any parameter of our current user terminal interface, without checking which user interface we are using, “current” option for the user-interface command can be used. I have never used it but it looks interesting. Arp-ping lets us to check whether a specified IP address or MAC address is being used in a LAN. Intrigued, I opened Huawei eNSP simulator to check this feature. Results are not fully satisfied. As arp-ping IP works correctly, I cannot say the same about arp-ping MAC. There are some problems with communication between router and hosts. 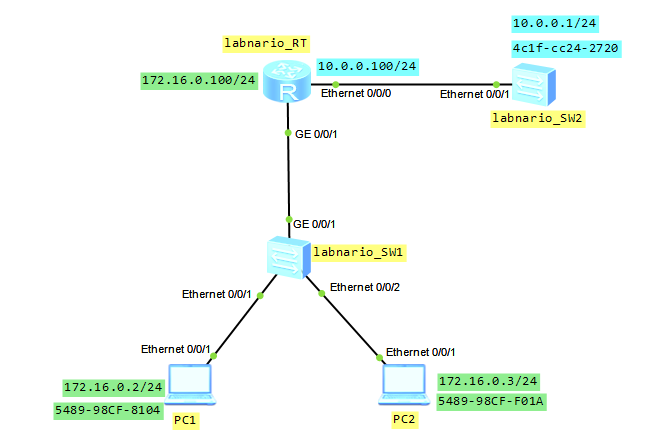 It looks like router does not receive ICMP Echo Reply packets from hosts in the LAN. I checked the same between router and switch “labnario_SW2″. Results look promising. Let’s pass on to the lab. Huawei devices support generic MAC (GMAC) ping and trace on Layer 2 networks. Network administrators can use GMAC ping and trace functions to detect Layer 2 network faults, without configuring CFM. GMAC ping works at the same manner like 802.1ag MAC ping. It uses the Loopback Message and Loopback Reply (LBM/LBR) and is similar to ICMP ping function. GMAC ping can be used without configuring the MD (Maintenance Domain), MA (Maintenance Association), or MEP (Maintenance association End Point) on the source device, intermediate device, and destination device, as it is required when using 802.1ag. You only need to enable the GMAC function on the intermediate device. Therefore, GMAC ping is applicable to part of or a whole network without reference to MD, MA, and MEP configurations. GMAC trace works at the same manner like 802.1ag MAC trace and uses Link Trace Message/Reply (LTR/LTM), so its function is similar to “trace route”. But GMAC trace can be implemented without configuring the MD, MA, or MEP on the source device, intermediate device, and the destination device. All the intermediate devices can respond with an LTR. Therefore, GMAC trace is applicable to part of or a whole network without reference to MD, MA, and MEP configurations. Today a few words about 2 simple but useful commands: lock and send. Let’s look how they work on Huawei S5700 switch. Info: The terminal is locked.